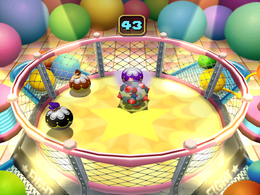 Hop or Pop is one of the 1-vs-3 minigames played in Mario Party 4. The name of the minigame is a pun on Dr. Seuss's book Hop on Pop. The camera shows the three players inside rubber balls as they bounce. They get shocked as a spiked ball with the solo player inside drops into the arena. The game begins. Each player on the team is inside a rubber ball, while the solo player is inside a spiked ball. The solo player must run around, trying to pop the other players by running into them. The team must hop around, avoiding them. If the solo player succeeds in popping all three team members, he or she wins. If any team member remains after 45 seconds, the entire team wins. After time runs out, or if all three players have their balls popped, the balls containing the players disappear. If the solo player wins, he or she will run to the center of the stage and do a winning pose while the team of three are nowhere to be found. If the any of the team of three remain, the team of three players win, and the remaining players of the team will do a winning pose while the soloist sulks. Game Rules – "One player gets in a spiky ball and tries to pop the balloons of the other three. If any of the three targets survive, all three win." Advice – "If the players with balloons time their jumps right, they can jump farther." This page was last edited on February 3, 2019, at 20:20.